What the heck is that!!!?? So the other day Anne and I were out for a walk in the park and came across this little guy pictured above. I think we simultaneously said, “What the heck is that thing?! 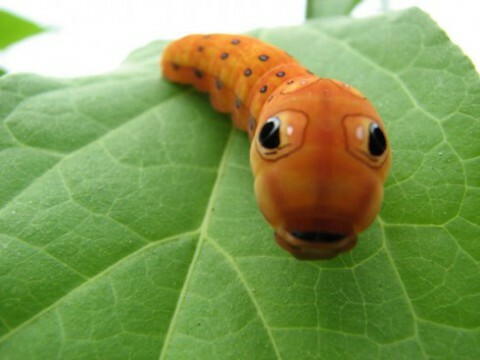 It looks like something out of a cartoon, freeky looking but kinda cute!” The little bright orange caterpillar with the big eyes made us stop in our tracks. I wanted to pick it up but was almost afraid it might be poisonous. (Silly, I know!). Anyway, after going home and googling it, we found out that it’s called an “Eye-Macros Caterpillar” and it turns into something called a Hawkmoth. Something tells me it’s not going to be as cute once it morphs into the second stage of it’s life! Today nature had the opportunity to strike again as Anne was aqua-jogging in one of our client’s ponds. As the story was told to me, a Heron swooped down a few times a little too close for comfort, maybe to check her out as her head bobbed up and down in the water. Being that it was quite a cool morning, I can’t say that I really blame the bird for being curious-after all, what human in their right mind would go out in the chilly morning for a dip? Ah, yes, of course…my wonderful wife that’s who! Either way, if that Heron had gotten the bite it might have been looking for, I think both Anne and that bird would have been in for a big surprise on both ends!